As a result of the journey, a movie balancing narrative documentary and artistic film will illustrate the complex interrelations between our natural and social surroundings. It all began in Sao Paolo in 2011 where I spent a year during an international film scholarship at the Universidade de São Paulo. With its skyscrapers, its concrete landscapes and its permanent noise level this megacity triggered in me quite promptly the yearning for nature, solitude and vastness. I have always been fascinated by deserts, lonely landscapes, the sea or the glance from a high mountain – by wide landscapes not hindering one’s view by any obstacle. Sao Paolo was the exact opposite. 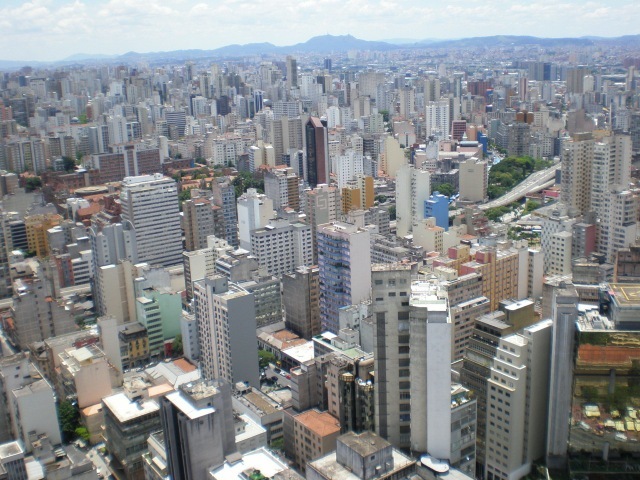 My living conditions in the concrete jungle of Sao Paolo seemingly led to the original idea of the LAND SAILOR-Project. Big cities keep inspiring me; still, sooner or later, as a lover of nature, I begin to feel the limits. To sail the roads of Patagonia and experience the vastness and the extremes of nature means adventure to me, but it also means following the desire for freedom and independence often felt in nature. This vastness and freedom also opens up the opportunity for me to realise projects which cannot be realised in populated or even urban surroundings. Could the LAND SAILOR be technically realised? How far would we get in Patagonia? How could I finance such a project? 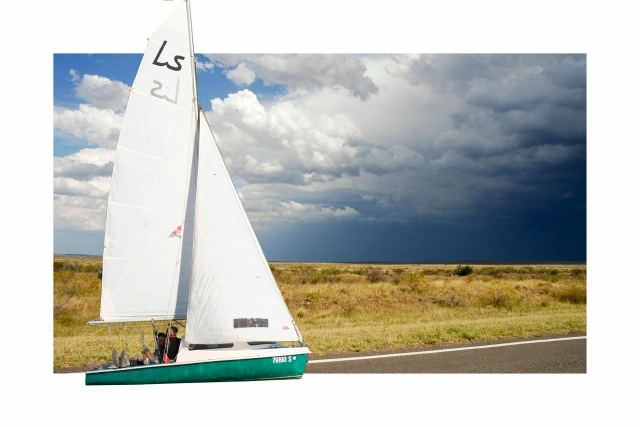 How would the public authorities in Argentina react to a sailing boat on the road? Would the wind be strong enough to move the boat, even uphill? Not being able to draw on experiences made in any projects comparable to this one, the risks of this arts experiment are still incalculable. But my fascination with the idea has fuelled my energy over the past years of preparation, and we finally made it: In one week’s time, the LAND SAILOR will set out to sail the roads of Patagonia! After deciding to actually try and realize this rather fantastic idea of the LAND SAILOR, I first had to find out if the project could be realized in a technological sense at all. Not knowing much about sailing myself at the time, I had to rely on the opinions of experts and spent quite some time researching into the conditions awaiting me in Patagonia. 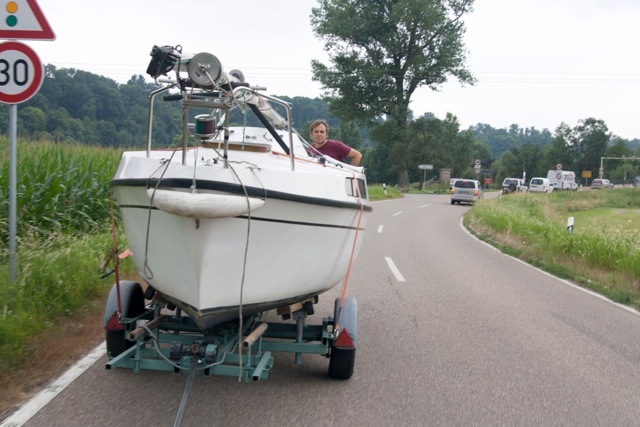 Sailing on the road means not to be able to tack and beat, as you do when sailing on the water. While researching, I found an engineer and passionate sailor who thought my idea to be rather crazy, but eventually feasible: Martin Kammerer of MarkOne. 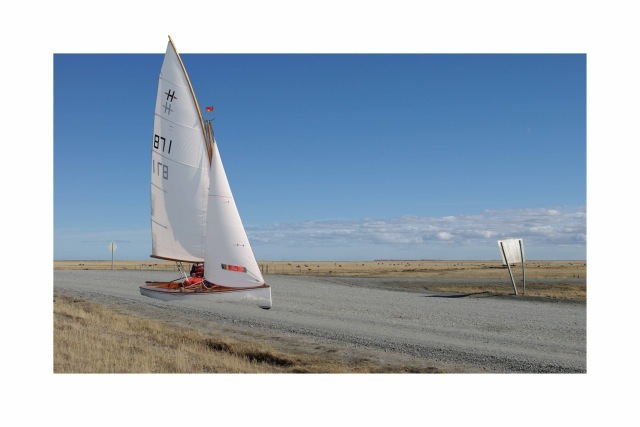 He was convinced that it was possible to create a construction for safely sailing on a road. He also persuaded his cousin Bernhard Sting to believe in my project, also an engineer and mechanic who was able to help me reconvert a sailing boat into a road cruiser. By their personal engagement, both men soon became irreplaceable backups for my project. In contrast to the construction, funding seemed more of a problem at the beginning. My attempt to finance the project by help of a crowdfunding-site and private contributors caused some disillusionment: the 6000 € earned were not sufficient to start realising the project. Still, the positive effect of the crowdfunding experiment was the affirmation that I got for my idea, above all in the art scene. 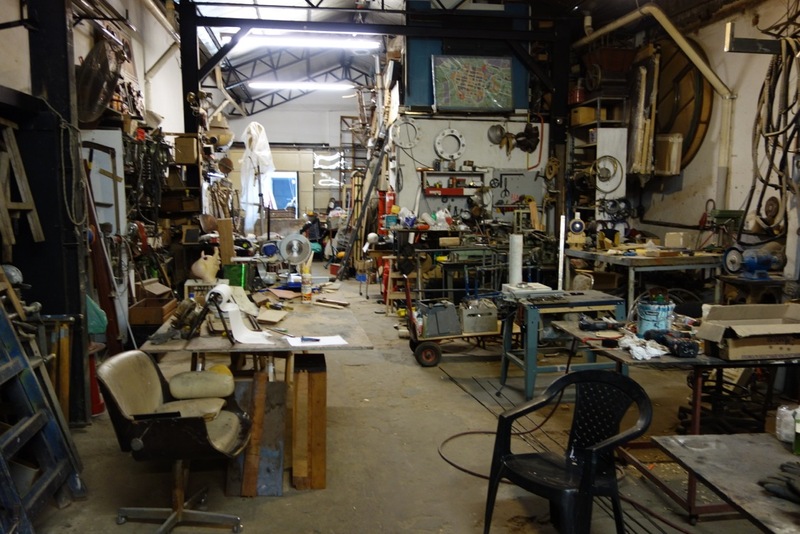 80% of donations were made by artists or people directly associated with the art scene. This approval encouraged me not to give up on the project. I had to give up, however, on my aspiring plan to put the project into practice in (Patagonian) summer 2012/13 and a postponement of one year’s time was inevitable. In February 2013 I travelled to Buenos Aires for the first time because I thought about constructing the LAND SAILOR in Argentina. 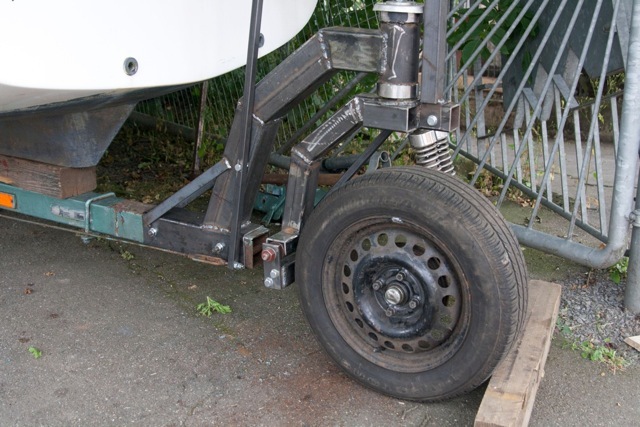 I had found an excellent mechanic who, I trusted, could reconvert the sailing boat. But in the end I decided not to build the LAND SAILOR in Argentina due to the higher costs of sailing boats there. The first offers made for freight forwarding of my LAND SAILOR to Argentina and back were between 5000 and 6000 €, which made the costs comparable to the higher production costs in Argentina. Organising the project as a foreigner of Argentina and not knowing Spanish very well seemed to me an extra barrier, though. First attempts at finding sponsors for my project in spring 2013 weren’t very successful. Although not even one fourth of the estimated expenses for the project were covered in summer 2013, I decided to leave Rio de Janeiro – where I was living by that time – for Germany. There, I wanted to start reconverting the sailing boat, still hoping that while doing so, new perspectives of funding would open up. 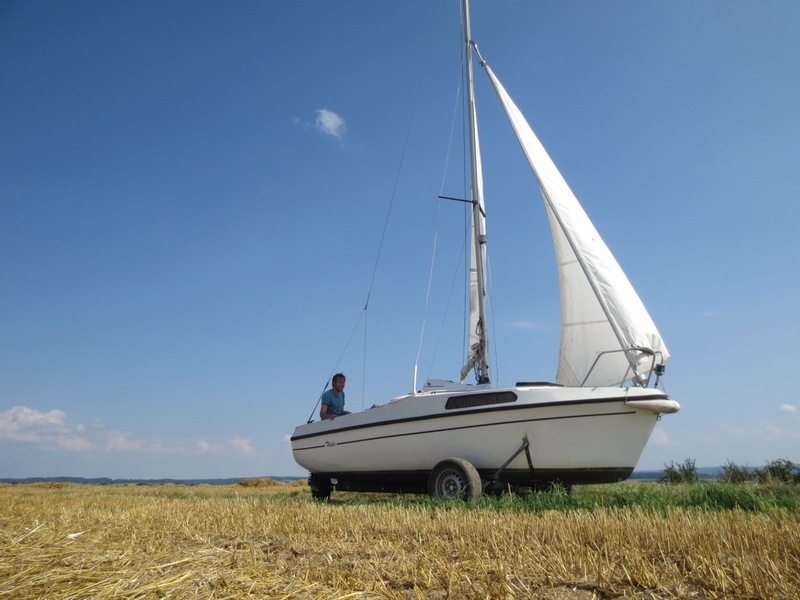 By getting financial support from MarkOne as well as spending all the money I had raised from private sources, I could buy a small second-hand sailing boat and start reconverting it. It stayed unclear for a long time, however, if all the costs, time and effort would pay off in the end. The conversion could fail, after all, which, then, would have meant financial disaster at the same time. Soon after, I gained the support of some curators who assured me that they would present the LAND SAILOR PROJECT in their museums as soon as it would be completed and documented. 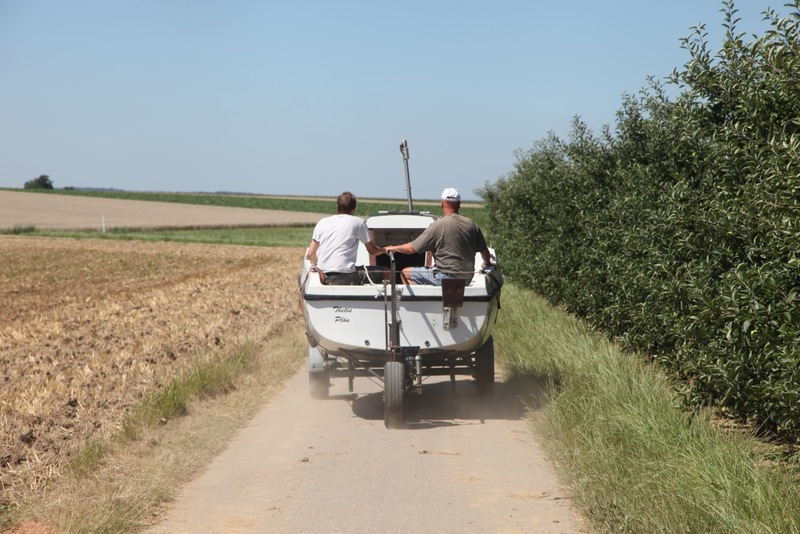 This first support spurred the dynamics of the whole project: The support as well as the fact that the conversion of the boat was already in process caught the interest and support of more sponsors, among those the film sponsorship of the MFG Baden-Württemberg – which is quite unusual for video art. For the first time, the basic financing seemed safe – if everything worked out according to my plans – which, again, is quite unusual for a project like mine. Of course, the money would only be provided if the overall costs (projected at 140.000 € by that time) were safely covered (which was not to be thought of yet) and if I could safely provide a movie. Financial aid is only guaranteed after many requirements have been fulfilled – precautions taken in order to make sure that the film production actually takes place. 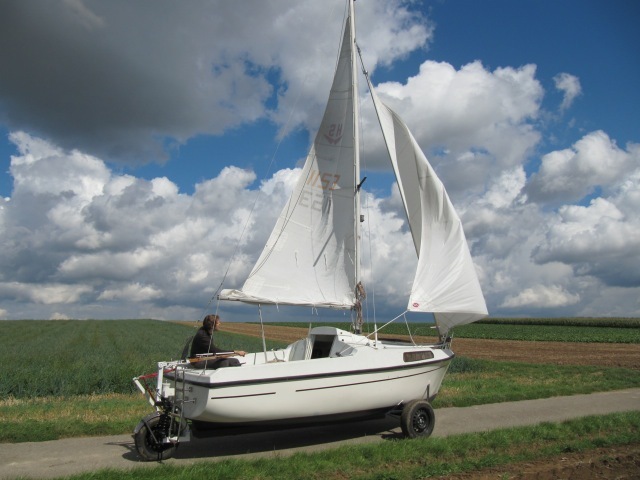 Meanwhile, the conversion of the sailing boat proceeded, including some problems. Here, as well, it stayed unclear if we could reach the aim of constructing a safe boat permitting me to sail on the Patagonian road. Where was the steering mechanism to be, how could it work (front or back)? Should we stick to the construction of a car, using as many prefabricated parts as possible, or create a completely new kind of vehicle? My own ideas, being those of an artist, often seemed light-years away of those of my engineers. What would happen in cross wind? Would the boat tilt over? How long must the axis be to prevent this – and how short must it be so that it would be possible to fit into a maritime container for transport? Lots of questions had to be answered. Several test runs were necessary for the steering mechanism and the brakes. 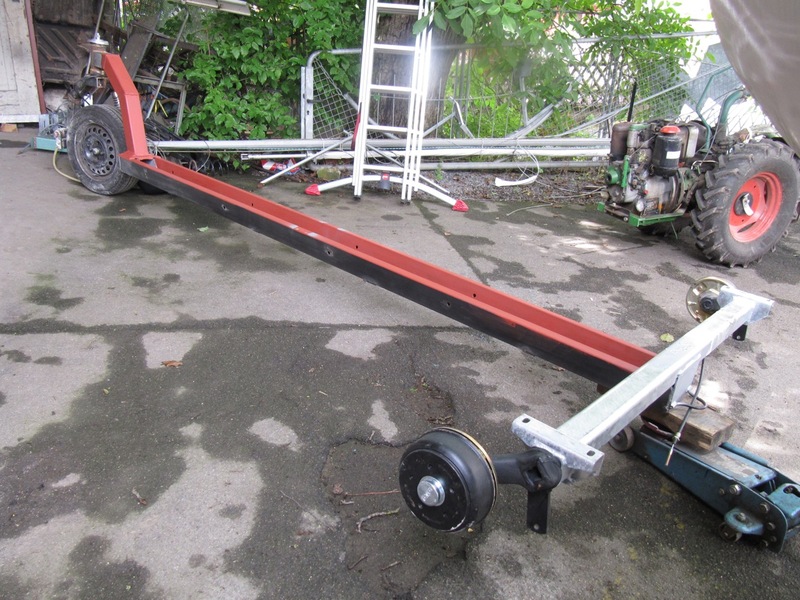 A windless German summer saw us install the steering mechanism on a trailer, drag it along on rural roads or slowly drive down hills. 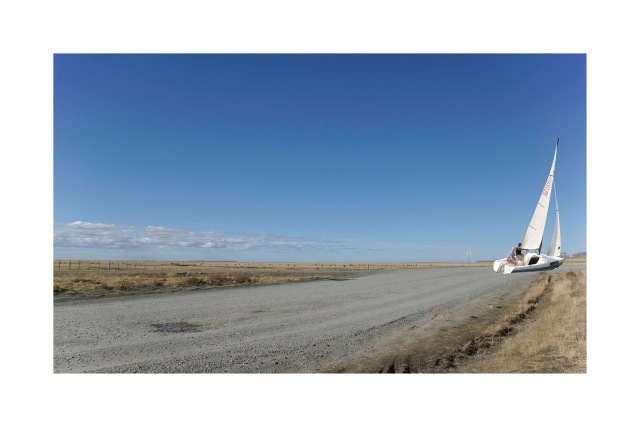 Although most results were satisfying, it was not until the last stage of testing that we had a bit of wind and could begin to imagine what it could be like to sail this vehicle in Argentina. With a structural weight of 600 kg, the LAND SAILOR even sailed up a slope. The original plan was that shipping of my LAND SAILOR should take place right after its completion in September 2013. It was to be shipped directly to Tierra del Fuego. I had arranged all the details of the shipping with the shipping company, the forwarding company and the customs of Ushuaia in Tierra del Fuego. 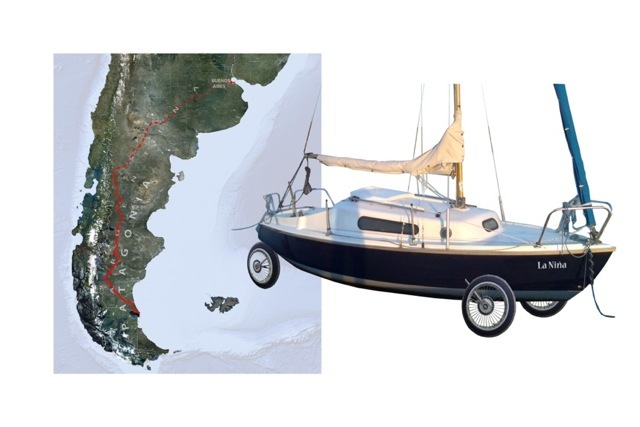 When talking to several international curators in Argentina, it became clear, however, that I would probably have great problems taking a sailing boat equipped with wheels from the special economic area in Tierra del Fuego to Patagonia. Declaring the ship at the customs in Ushuaia would not necessarily mean being able to take it to the Argentinian mainland. And I would have to pass the Chilean border, too, where even common cars are often forbidden to pass. This information given, I decided to start my project on the Patagonian mainland instead of Tierra del Fuego, the southernmost point of Argentina. But there was more trouble ahead, as I was soon to find out. To cut a long story short: I didn’t find any company who was able to guarantee a successful deal with the Argentinian customs – or the costs were far from affordable to me. Even a producer who had long worked with the ZDF in Argentina, didn’t find any reasonable solution for me in weeks. The reason why customs are so much more of a problem with the Argentinian mainland than with Tierra del Fuego is to be found in the protectionism carried out by President Kirchner to protect the Argentinian economy from the competition with foreign products. Even the German embassy and the Goethe Institut Buenos Aires reassured me that it was extremely difficult to take goods to Argentina at the moment. At this point, the LAND SAILOR project seemed to fail. Then, I finally found two Argentinian producers with good relations to forwarding companies and the customs whose estimated costs were higher than what I had planned to spend on transport, but still affordable, and who thought they could get the boat through the customs. I could also win over the Sivori Museum in Buenos Aires to present my project after its completion as well as getting into contact with Argentina’s ministry of education. Thus, I thought my project could finally start with three months of delay due to the problems with the customs. In the end, things were to work out differently, again. My boat was finally meant to be shipped before Christmas 2013 or after New Year at the latest. An Argentinian producer was commissioned to prepare all the deals with the customs. Then I suddenly got the message that I was no longer recommended to ship the LAND SAILOR, as more problems were showing up along the way after a new Customs Act had been passed. With harbour dues of 375 € per day and – probably necessary and incalculable – bribe money the original costs for the shipping estimated at 5.000 € would definitely more than double. Not only would these costs have blown the budget, I wouldn’t have had any guarantee even then that the LAND SAILOR would safely go through the customs. Another point was that I received a message from one of my crew members about his having to be back in Germany on March 20th as he was then expected to take office at a post as a lecturer then. Every member of my crew being irreplaceable, a further postponement of the project was beyond question. If I didn’t get the LAND SAILOR through the customs, I wouldn’t be entitled to claim the MFG film sponsorship anymore – and I would have to cover all financial risks on my own. With lots of cooperations with museums already arranged and my personal funds exhausted, I had to decide whether I should give up on the project after all or keep going, thereby taking the risk to lose everything. Or what about a completely different way? 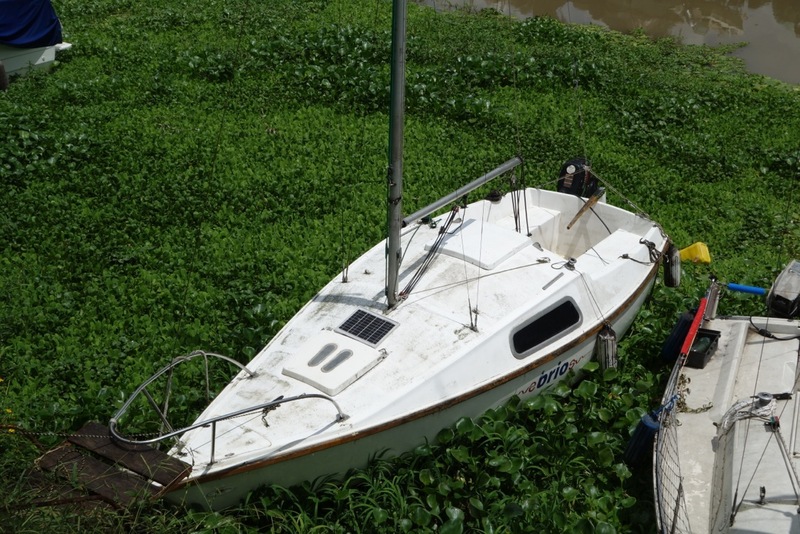 What about starting anew by saving the shipping costs and buying and reconverting another sailing boat in Argentina? This seemed a crazy idea at first. Before rejecting the idea as absurd, I thought about it. On the one hand, the costs might be lower than those for the transport of the old boat from Germany to Argentina. On the other hand, the effort seemed immense. 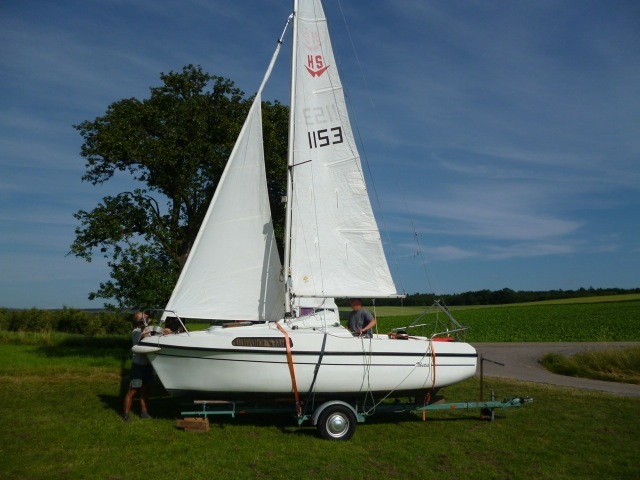 We had needed three months for buying, converting and testing the first sailing boat in Germany, and we might have taken much longer without the knowhow of my Swabian mechanic. The components for the LAND SAILOR, above all for the chassis, were not always easy to get hold of, either. How should all that work out in a country whose language I don’t speak very well and in a much shorter period of time – moreover during the Argentinian summer holidays? My second chance depended on Mariano, the mechanic who I had found in February 2013: If he and his team had the time to work on the new LAND SAILOR and if the Argentinian producers could find me a good and affordable boat in Buenos Aires during the Christmas holidays, we could take the risk of starting anew. And indeed: This time, I was lucky. Miraculously, everything fell into place. Mariano had some weeks off – and he still felt like taking part in my project. His assistants were also ready to sacrifice their holidays so that they thought they could manage to convert the sailing boat in 3 or 4 weeks time, reckoning that they could rely on the experience from the conversion of the first boat in Germany. The budget was acceptable, and I knew that Mariano meets deadlines, as he usually works for theatre and cinema productions. Nico, my producer, found some suitable sailing boats. He sent me images and inspected some of the boats over the holidays. He also assured me that he would be available in January to help realising my project and support the mechanics in searching apt components for the LAND SAILOR. All this lead to my preferring the adventure of converting a second boat to the adventure of shipping the old one. I booked a flight to Buenos Aires for January 9th. The boat should then already be waiting in Mariano’s garage, ready to be worked at. My film team would arrive at the end of January for some test runs near Buenos Aires, before film shootings in Patagonia were to start on February 9th.